HCM City (VNA) – Vietnamese readers, particularly youth, will have more opportunities this summer to learn more about the country’s history after the release of new books. The collection titled Goc Nhin Su Viet (A View of Vietnamese History), for example, includes 31 books on Vietnamese history from different periods. The books feature Vietnamese kings, generals and national heroes such as the sisters Trung, Quang Trung, Tran Hung Dao and Phan Dinh Phung. Goc Nhin Su Viet is part of a long-term programme launched this year by Alpha Books that will publish 100 history books for children and young people. The programme’s founders, including cultural researchers and historians, have collected and compiled stories from different sources to offer useful and entertaining books. Other featured books are Lich Su Vietnam (Vietnamese History) and Lich Su Tu Tuong Quan Su Vietnam (History of Vietnamese Military), both of which received the 2016 Best Book Award presented by the Vietnam Publishing Association. These books focus on the victories of the Vietnamese people and soldiers during military conflicts. The works are helpful for students at universities and colleges. Xu Dong Duong-L’Indo-Chine francaise: Souvenirs (Indochina) is a good choice for readers who love to read about the French colonial period. Published by Alpha Books, the book was written by Joseph Athanase Paul Doumer, Governor General of Indochina between 1897 and 1902. It has been translated by a group of five authors. The book features Vietnamese history, culture and lifestyle through the writer’s eyes. The Nha Nam Publishing House will soon release a new history book written by four French authors who worked in Vietnam between 1925 and 1935. The book tells stories about the daily life of poor people living in Saigon (HCM City now) and Hai Phong. The information about Phan Boi Chau, a pioneer of 20th century Vietnamese nationalism, comes from writing by Louis Roubaud in 1930. Unlike previous years, publishers have decided to add history books to their lists for the summer instead of comics. "We see many youngsters becoming excited about history by reading and appreciating their own traditional culture,” said Tran Dai Thang, Director of the Sach Dong A Company, one of the city’s prestigious distributors. Thang said there was a shortage of new books on Vietnam’s history every summer. “We are working to improve this situation,” he said. According to lecturer and educator Tran Huu Ta of the city’s Pedagogical University, who has written history books appreciated by younger readers, it is difficult for publishers and authors to offer such books because they must strike a balance between social responsibility and profit. "Children prefer comics and cartoons about fighting while young people enjoy romantic stories. History is not their favourite. Authors and publishers do not have an incentive to create such books," he explained. Ta said that social organisations and publishing houses should work with authors and editors to publish more books featuring historical events, national heroes and heroic martyrs. "Teachers and parents should spend more time encouraging their children to enjoy national history," he said. The Tre (Youth) Publishing House, one of the country’s biggest publishers, has attracted a staff of several well-known authors and historians creating books for young people. The authors include Tran Dang Khoa, Quach Tho, Nguyen Nghiep and Nguyen Thuy Kha. 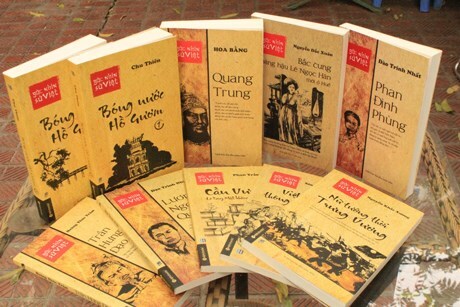 The publisher’s two history books, Lich Su Vietnam (The History of Vietnam) and Lich Su Nuoc Ta (Our Country’s History), have been reprinted and sold in many bookstores around the city, receiving a warm response from young readers. While Tre prefers to publish books featuring the country’s ancient history, its competitor, the Kim Dong Publishing House, tends to print modern history books written by well-known authors like To Hoai and Nguyen Huy Tuong.